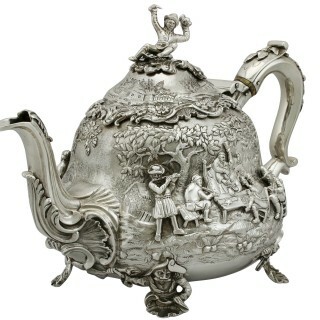 A magnificent, fine and impressive antique George IV English sterling silver teapot; an addition to our silver teaware collection. 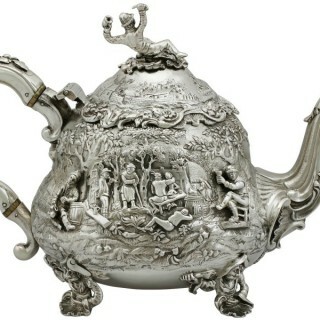 This magnificent antique George IV English sterling silver teapot has a circular baluster shaped form onto four feet. 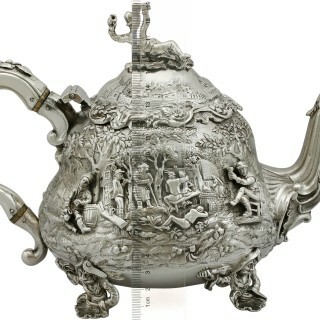 The body of this antique silver teapot is embellished with magnificent applied and chased decoration depicting figures drinking, conversing and supporting each other in an outdoor tavern setting; it can be determined that the ornamentation was influenced by Flemish/Dutch genre artwork, such as pieces crafted in the late 17th century by David Teniers II. 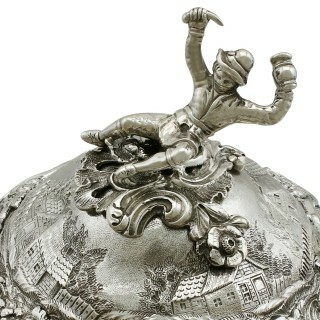 This silver teapot is fitted with a hallmarked hinged cover surmounted with the original figural finial displaying a male character perched on a brewery cask with both arms elevated; the finial secures to the interior of the cover with a wing nut. 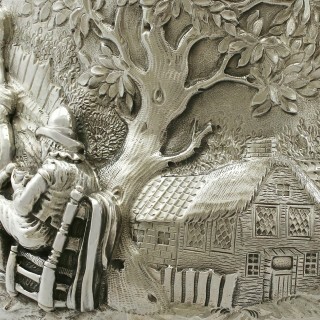 The cover is encircled with further chased decoration featuring a continuation of the outdoor inn scene from that of the body, in addition to a shaped scrolling leaf decorated border to the rim. 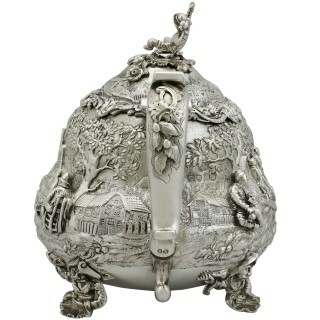 This exceptional example of antique teaware retains the hallmarked cast sterling silver opposing scroll handle ornamented with applied vine style decoration to the upper portion of the handpiece. 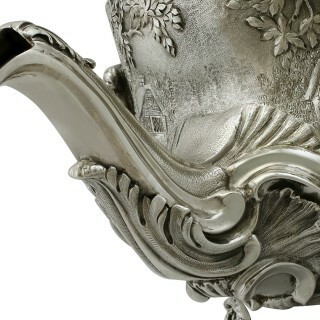 This antique teapot is fitted with a magnificent cast spout ornamented with large scrolling leaf ornamentation to the lower portion, incorporating matte textures. 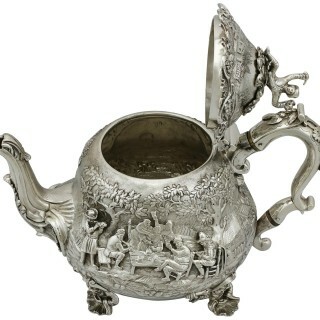 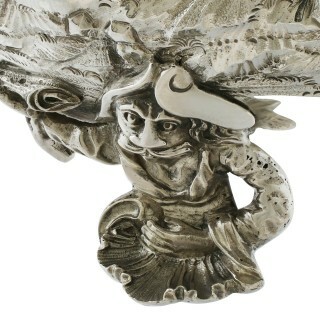 The teapot is supported by four magnificent cast and applied figural style feet. 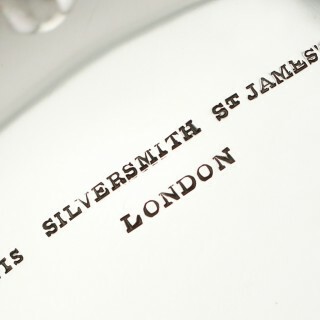 This magnificent example of antique silverware, crafted by the renowned London silversmith Edward Farrell, is the finest of its type you could hope to acquire. 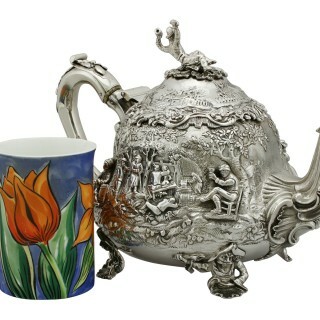 This antique English sterling silver teapot is a magnificent gauge of silver, exceptional quality and in exceptional condition. 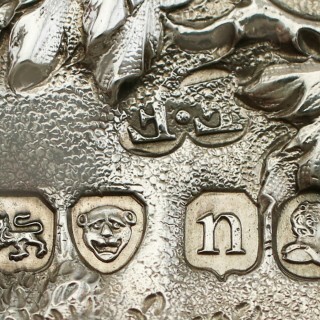 The cast, applied and chased decoration is all very sharp. 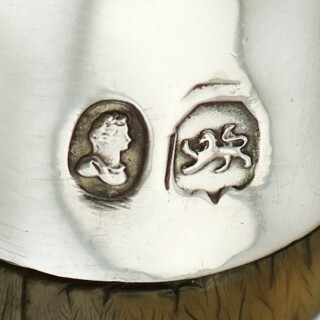 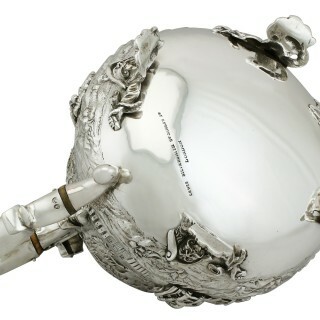 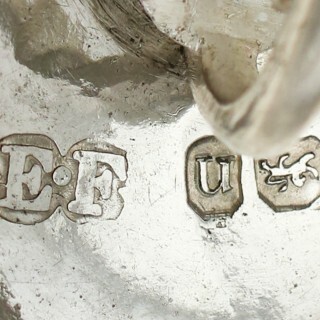 Full hallmarks struck to the underside of the teapot and part hallmarks to the interior of the cover, finial and handle are all very clear; the hallmarks are struck deeply due to the magnificent gauge of silver.